Last week’s City Commission Meeting proved fruitful for the parks of San Benito. City leaders decided to allocate $16,048.17 of the available 2016-2017 CDBG unused federal funds toward public goods, in this case, the city parks. There was some deliberation, however, prior to the decision. While it was Commissioner Tony Gonzalez who originally motioned for the parks to receive the amount, Commissioner Rene Villafranco also motioned to divide the money between two local non-profits: Court Appointed Special Advocates (CASA), which is an adoption agency, and the Boys & Girls Club of San Benito. Specifically, Villafranco proposed distributing $10,000 to CASA and the remaining $6,000 to the Boys & Girls Club, citing that the last time these types of funds were distributed, the Club received more than the other organization that had applied. After the two Commissioners shared their proposals, Commissioner Ricardo Guerra had his own insight to add on the matter. With that, along with Gonzalez’s and Mayor Ben Gomez’s backing, the motion passed and the funds are set to be distributed to Parks & Rec. 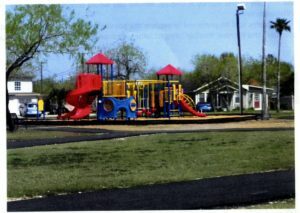 Parks & Recreation Director Art Garza III said that he hopes to use the funds for the new Southside Park being constructed behind the Fire Station on Sam Houston. According to city officials, the $16,000 surplus resulted from unspent funds initially allocated to the START Center in the amount of $7,000, general administration funds for the amount of $9,150, and miscellaneous funds for the Senior Community Outreach Program and the Resaca Trail debt payment, which also comes from CDBG funds. Subscribe here to get the full story and more, or grab a copy at one of our various newspaper racks – Thank you!